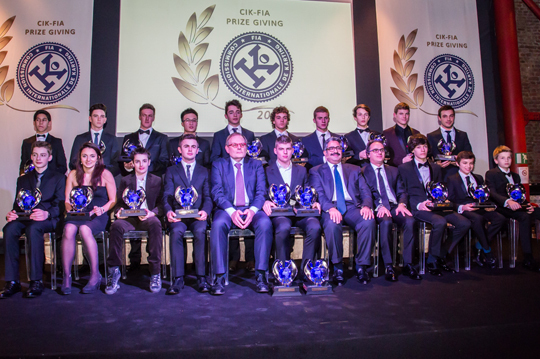 After many editions of the CIK-FIA prize giving ceremony held in Paris, the East End Studios in Milan, Italy were chosen to host the 2013 awards on Saturday 11th January. The 2013 CIK-FIA champions have been awarded by the CIK President Sheik bin Isa Al Khalifa Abdulla, by the vice President Kees van de Grint, and WSK Promotion President Luca De Donno, as well as an array of other important guests. Besides the winners of each CIK-FIA championship, also the 2nd and 3rd classified drivers in the World Championships for KF, KF Junior and KZ were awarded a trophy. And for the fifth time, KSP photo agency was awarded the Best Photograph of the Year award.